Sources disagree on the word's meaning. 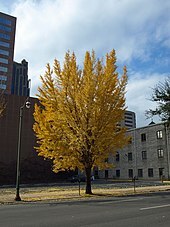 Some scholars suggest the word comes from the Choctaw alba (meaning "plants" or "weeds") and amo (meaning "to cut", "to trim", or "to gather"). The meaning may have been "clearers of the thicket"  or "herb gatherers",   referring to clearing land for cultivation  or collecting medicinal plants. The state has numerous place names of Native American origin. However, there are no correspondingly similar words in the Alabama language. Among the historical tribes of Native American people living in present-day Alabama at the time of European contact were the Cherokee, an Iroquoian language people; and the Muskogean-speaking Alabama (Alibamu), Chickasaw, Choctaw, Creek, and Koasati. 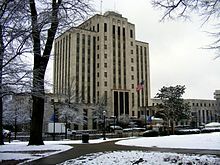 While part of the same large language family, the Muskogee tribes developed distinct cultures and languages. By 1860, the population had increased to 964,201 people, of which nearly half, 435,080, were enslaved African Americans, and 2,690 were free people of color. 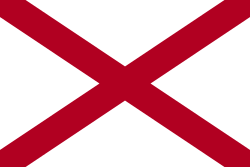 On January 11, 1861, Alabama declared its secession from the Union. After remaining an independent republic for a few days, it joined the Confederate States of America. The Confederacy's capital was initially at Montgomery. Alabama was heavily involved in the American Civil War. Although comparatively few battles were fought in the state, Alabama contributed about 120,000 soldiers to the war effort. 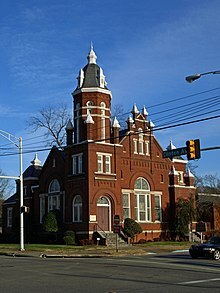 Reconstruction in Alabama ended in 1874, when the Democrats regained control of the legislature and governor's office through an election dominated by fraud and violence. 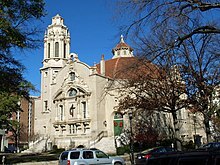 They wrote another constitution in 1875,  and the legislature passed the Blaine Amendment, prohibiting public money from being used to finance religious-affiliated schools. The same year, legislation was approved that called for racially segregated schools. Railroad passenger cars were segregated in 1891. 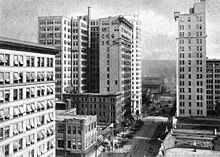 After disfranchising most African Americans and many poor whites in the 1901 constitution, the Alabama legislature passed more Jim Crow laws at the beginning of the 20th century to impose segregation in everyday life. Industrial development related to the demands of World War II brought a level of prosperity to the state not seen since before the civil war. Rural workers poured into the largest cities in the state for better jobs and a higher standard of living. 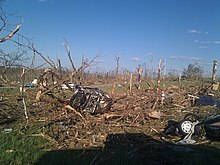 One example of this massive influx of workers occurred in Mobile. Between 1940 and 1943, more than 89,000 people moved into the city to work for war-related industries. Cotton and other cash crops faded in importance as the state developed a manufacturing and service base. In 1972, for the first time since 1901, the legislature completed the congressional redistricting based on the decennial census. This benefited the urban areas that had developed, as well as all in the population who had been underrepresented for more than 60 years. Other changes were made to implement representative state house and senate districts. 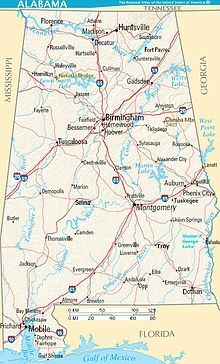 Alabama is bordered by the states of Tennessee to the north, Georgia to the east, Florida to the south, and Mississippi to the west. 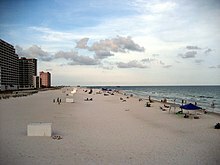 Alabama has coastline at the Gulf of Mexico, in the extreme southern edge of the state. The state ranges in elevation from sea level  at Mobile Bay to over 1,800 feet (550 m) in the Appalachian Mountains in the northeast. 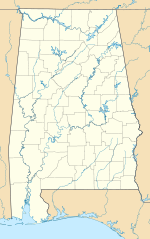 Additionally, Alabama has four National Forests: Conecuh, Talladega, Tuskegee, and William B. Bankhead. 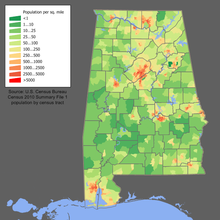 Alabama also contains the Natchez Trace Parkway, the Selma To Montgomery National Historic Trail, and the Trail Of Tears National Historic Trail. A notable natural wonder in Alabama is "Natural Bridge" rock, the longest natural bridge east of the Rockies, located just south of Haleyville. Immigration from outside the U.S. resulted in a net increase of 31,180 people, and migration within the country produced a net gain of 73,811 people. The state had 108,000 foreign-born (2.4% of the state population), of which an estimated 22.2% were undocumented (24,000). 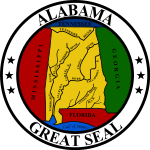 In 1984, under the Davis–Strong Act, the state legislature established the Alabama Indian Affairs Commission. Native American groups within the state had increasingly been demanding recognition as ethnic groups and seeking an end to discrimination. Given the long history of slavery and associated racial segregation, the Native American peoples, who have sometimes been of mixed race, have insisted on having their cultural identification respected. In the past, their self-identification was often overlooked as the state tried to impose a binary breakdown of society into white and black. Alabama's agricultural outputs include poultry and eggs, cattle, fish, plant nursery items, peanuts, cotton, grains such as corn and sorghum, vegetables, milk, soybeans, and peaches. 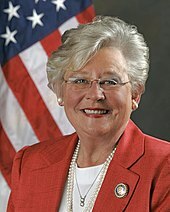 Although known as " The Cotton State", Alabama ranks between eighth and tenth in national cotton production, according to various reports,   with Texas, Georgia and Mississippi comprising the top three. There has been a significant movement to rewrite and modernize Alabama's constitution. Critics argue that Alabama's constitution maintains highly centralized power with the state legislature, leaving practically no power in local hands. Most counties do not have home rule. Any policy changes proposed in different areas of the state must be approved by the entire Alabama legislature and, frequently, by state referendum. One criticism of the current constitution claims that its complexity and length intentionally codify segregation and racism. Until 1964, the state elected state senators on a geographic basis by county, with one per county. It had not redistricted congressional districts since passage of its constitution in 1901; as a result, urbanized areas were grossly underrepresented. It had not changed legislative districts to reflect the decennial censuses, either. In Reynolds v. Sims (1964), the US Supreme Court implemented the principle of " one man, one vote", ruling that congressional districts had to be reapportioned based on censuses (as the state already included in its constitution but had not implemented.) Further, the court ruled that both houses of bicameral state legislatures had to be apportioned by population, as there was no constitutional basis for states to have geographically based systems. The corporate income tax rate is currently 6.5%. The overall federal, state, and local tax burden in Alabama ranks the state as the second least tax-burdened state in the country. Property taxes are the lowest in the U.S. The current state constitution requires a voter referendum to raise property taxes. The state legislature has retained power over local governments by refusing to pass a constitutional amendment establishing home rule for counties, as recommended by the 1973 Alabama Constitutional Commission. Legislative delegations retain certain powers over each county. United States Supreme Court decisions in Baker v. Carr (1964) required that both houses have districts established on the basis of population, and redistricted after each census, in order to implement the principle of "one man, one vote". Before that, each county was represented by one state senator, leading to under-representation in the state senate for more urbanized, populous counties. The rural bias of the state legislature, which had also failed to redistrict seats in the state house, affected politics well into the 20th century, failing to recognize the rise of industrial cities and urbanized areas. 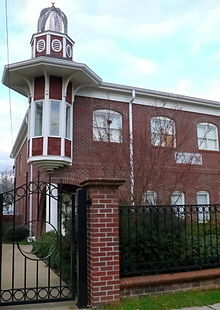 Alabama state politics gained nationwide and international attention in the 1950s and 1960s during the civil rights movement, when whites bureaucratically, and at times violently, resisted protests for electoral and social reform. Governor George Wallace, the state's only four-term governor, was a controversial figure who vowed to maintain segregation. Only after passage of the federal Civil Rights Act of 1964  and Voting Rights Act of 1965 did African Americans regain the ability to exercise suffrage, among other civil rights. In many jurisdictions, they continued to be excluded from representation by at-large electoral systems, which allowed the majority of the population to dominate elections. Some changes at the county level have occurred following court challenges to establish single-member districts that enable a more diverse representation among county boards. With the disfranchisement of Blacks in 1901, the state became part of the " Solid South", a system in which the Democratic Party operated as effectively the only viable political party in every Southern state. 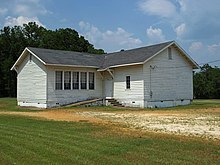 For nearly 100 years, local and state elections in Alabama were decided in the Democratic Party primary, with generally only token Republican challengers running in the General Election. Since the mid to late 20th century, however, there has been a realignment among the two major political parties, and white conservatives started shifting to the Republican Party. In Alabama, majority-white districts are now expected to regularly elect Republican candidates to federal, state and local office. Members of the nine seats on the Supreme Court of Alabama  and all ten seats on the state appellate courts are elected to office. Until 1994, no Republicans held any of the court seats. In that general election, the then-incumbent Chief Justice, Ernest C. Hornsby, refused to leave office after losing the election by approximately 3,000 votes to Republican Perry O. Hooper, Sr.. Hornsby sued Alabama and defiantly remained in office for nearly a year before finally giving up the seat after losing in court. This ultimately led to a collapse of support for Democrats at the ballot box in the next three or four election cycles. 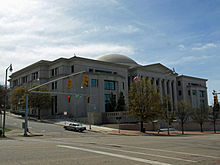 The Democrats lost the last of the nineteen court seats in August 2011 with the resignation of the last Democrat on the bench. In the U.S. House of Representatives, the state is represented by seven members, six of whom are Republicans: ( Bradley Byrne, Mike D. Rogers, Robert Aderholt, Morris J. Brooks, Martha Roby, and Gary Palmer) and one Democrat: Terri Sewell who represents the Black Belt as well as most of the predominantly black portions of Birmingham, Tuscaloosa and Montgomery. 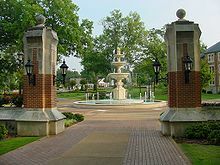 Alabama has hosted several professional golf tournaments, such as the 1984 and 1990 PGA Championship at Shoal Creek, the Barbasol Championship ( PGA Tour), the Mobile LPGA Tournament of Champions, Airbus LPGA Classic, and Yokohama Tire LPGA Classic ( LPGA Tour), and The Tradition ( Champions Tour). 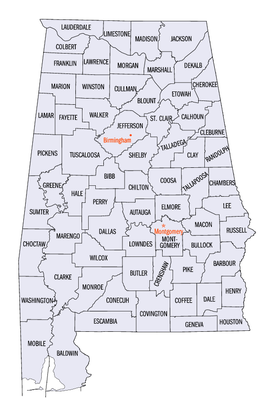 Alabama has six major interstate roads that cross the state: Interstate 65 (I-65) travels north–south roughly through the middle of the state; I-20/ I-59 travel from the central west Mississippi state line to Birmingham, where I-59 continues to the north-east corner of the state and I-20 continues east towards Atlanta; I-85 originates in Montgomery and travels east-northeast to the Georgia state line, providing a main thoroughfare to Atlanta; and I-10 traverses the southernmost portion of the state, traveling from west to east through Mobile. I-22 enters the state from Mississippi and connects Birmingham with Memphis, Tennessee. In addition, there are currently five auxiliary interstate routes in the state: I-165 in Mobile, I-359 in Tuscaloosa, I-459 around Birmingham, I-565 in Decatur and Huntsville, and I-759 in Gadsden. A sixth route, I-685, will be formed when I-85 is rerouted along a new southern bypass of Montgomery. A proposed northern bypass of Birmingham will be designated as I-422. Since a direct connection from I-22 to I-422 will not be possible, I-222 has been proposed, as well. The Port of Mobile, Alabama's only saltwater port, is a large seaport on the Gulf of Mexico with inland waterway access to the Midwest by way of the Tennessee-Tombigbee Waterway. The Port of Mobile was ranked 12th by tons of traffic in the United States during 2009. The newly expanded container terminal at the Port of Mobile was ranked as the 25th busiest for container traffic in the nation during 2011. The state's other ports are on rivers with access to the Gulf of Mexico. ^ and possibly Alabahmu. [ citation needed] The use of state names derived from Native American languages is common in the US; an estimated 27 states have names of Native American origin. Weiss, Sonia (1999). The Complete Idiot's Guide to Baby Names. Mcmillan USA. ISBN 978-0-02-863367-1. OCLC 222611214. ^ a b Swanton, John R. (1953). "The Indian Tribes of North America". Bureau of American Ethnology Bulletin. 145: 153–174. hdl: 2027/mdp.39015005395804. Archived from the original on August 4, 2007. Retrieved August 2, 2007. ^ a b Swanton, John R. (1937). "Review of Read, Indian Place Names of Alabama". American Speech. 12 (12): 212–215. doi: 10.2307/452431. JSTOR 452431. ^ a b c d Tullos, Allen (April 19, 2004). "The Black Belt". Southern Spaces. Emory University. doi: 10.18737/M70K6P. Retrieved September 23, 2006. ^ "Baker V. Carr and Legislative Apportionments: A Problem of Standards". The Yale Law Journal. 72 (5): 968–1040. 1963. doi: 10.2307/794657. JSTOR 794657. ^ a b "Annual Estimates of the Population for the United States, Regions, States, and Puerto Rico: April 1, 2010 to July 1, 2012". U.S. Census Bureau. Archived from the original ( CSV) on February 5, 2009. Retrieved December 24, 2012. ^ Aneesa McMillan. " 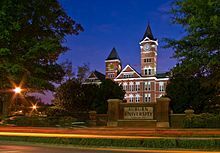 Top of the List: Alabama's largest employers" (April 22, 2011). 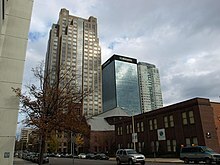 Birmingham Business Journal. ^ " Hunt Refining Company." Linkedin. ^ " Company Overview." JVC America, Inc.
^ "Comparison of State and Local Retail Sales Taxes". Archived from the original on May 20, 2007. Retrieved 2007-05-26. CS1 maint: BOT: original-url status unknown ( link). taxadmin.org, July 2004, Retrieved December 18, 2013.